Generate on the fly image placeholders for use in your web designs or HTML workings. By specifying a size or dimension the service will render a box with random background color of the desired size. It’s quick, simple and best of all, its 100% to use. Should you wish to pay for the service anyway, your more then welcome to give a link back to the site. 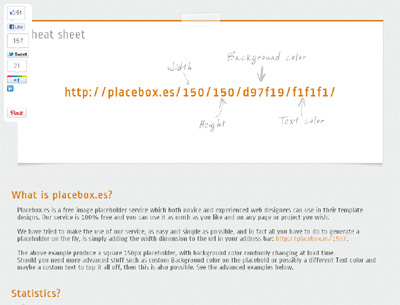 placebox.es beats the competition due to the high amount of costumization possibilities.